This web page contains the logs of a 23 day singlehanded sailing trip that I took with S/Y Thetis in the Aegean in Greece. The logs cover the first leg of the trip, a period of 10 days of sailing from from the island of Samos to the island of Syros (Grammata, Finikas) via the islands of Fourni, Rhinia, and Tzia. The logs are illustrated with photographs and maps they also include some historical and geographical descriptions of the places visited as well as several links to other related web sites. Thetis spent this time in the Pythagorio marina. We had several visitors in Kalami including Arzu, Turgut, and Dilek Ayker with their new boat S/Y New Life II a Bavaria 42. They were on their way back to Çesme after returning from EMYR, the East Mediterranean Yacht Rally from Turkey to Syria, Lebanon, Israel, and Egypt. They had a great time and fortunately returned just in time before hostilities between Israel and Lebanon flared up again. Also we did have some other visitors including my old schoolmate from Athens College Stavros Stephanakis and his wife Ginny and my brother Nikos with his fabulous caïque the Faneromeni. We made some day trips with Thetis to nearby swimming spots. 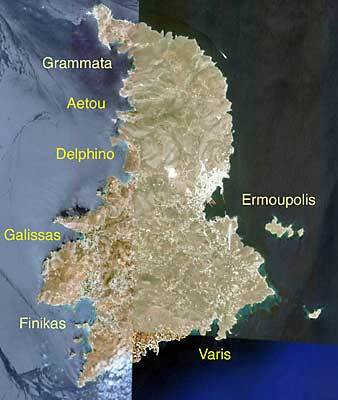 Today my wife Alice left Samos for Washington, D.C. and I too left with Thetis for a cruise to the Cyclades. Yesterday I provisioned and washed down the boat and at 1045 today I cast off. We departed the marina without any trouble other than the heat. In the past few days we have had a heat wave in Samos with temperatures in the upper thirties, Celsius. Today, inside Thetis’ cabin it was 31° C (88°F) with 61% humidity and the barometer at 1001 mB. As soon as we were outside the harbor I stopped the boat and had a refreshing swim. 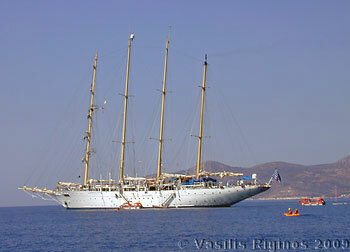 Anchored off Pythagorio was a 4-masted cruising ship which I photographed. I headed for Fourni or Fournoi. The wind was was 8-22 knots from the WNW and there was a considerable and annoying chop. Being rather hot I put up the tent and motored part of the way until I was able to motor-sail with the headsail opened from 30 to 50%. For a while I was able to turn off the engine but soon I was back to motor-sailing again. We arrived in the Visiliá cove [37° 30.4' N 26° 30.4' E] located on the east side of Fournoi at 1545 after 24.1 nautical miles (M). This cove is well protected from the westerlies and it was very calm. 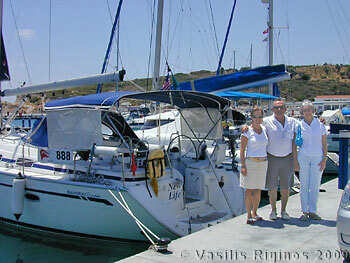 There was another sailboat in the cove the British S/Y Cresswell Jenny with Karin and Andrew Gerswell. I anchored without any difficulty in 4.5 m depth letting out only 20 m of chain so that Thetis will not drift too far within the narrow cove. After some rest and when the sun was low in the horizon I removed the tent and launched the dinghy, a rather lengthy operation. I then helped Andrew set a second anchor because the two boats were drifting too close to each other. Following this operation Karin and Andrew came aboard Thetis for an ouzo. The crew of Thetis was too tired and too lazy to cook so we settled for an omelet and some rice. I was hopping for a spectacular moon-rise, the moon being one day short of full, but I was disappointed. It rose behind the island in the SSE. This was a hot and lazy day spent mostly in organizing Thetis for cruising. The forecasts call for SW wind, strong in the afternoon but then weakening in the evening. I decided to sail to Rhinia overnight and enjoy the full moon while it was calm. In the afternoon I cooked a roast beef that I had bought in Samos. I cooked it in the pot with garlic and lemon. I had some trouble with the fresh water pump. Its filter was clogged and there was air in the lines. I fixed it. After dusk I ate some of the roast with young potatoes from Kalami. It was delicious. Following dinner I prepared for departure. At 2100 I raised the anchor and motored out of the cove. I ran the water-maker and verified that it was working properly. The sea was calm with a variable breeze of 5-12 knots from anywhere between SW and NW. The August moon was spectacular indeed. I raised the mainsail but the wind was too light and I had to motor-sail. Too bad! Nevertheless motor-sailing under the moon in a relatively calm sea was like a dream. I put on earphones (Bose QuietComfort) to cut down the drone of the engine and listened to classical music. What a lovely night! What a wonderful way to travel! 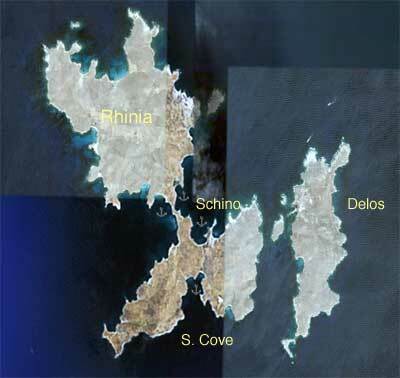 By the time we had reached Myconos the wind was coming either from the W or from the SW. My favorite cove in the south of Rhinia would be too exposed so we went up the Delos channel and entered the cove of Schino [37° 23.7' N 25° 14.7' E] in Rhinia. I dropped the anchor in 5 m over sand at 0920. We had come 65.8 nauticalM from Fourni. There were no other boats here. 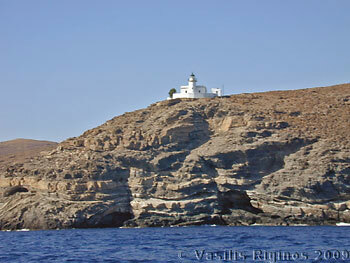 Rhinia is an ideal stopping place right in the middle of the Cyclades. Because it is low-lying there are less gusts and it is so indented with many coves all around that no matter where it blows from there is always an excellent shelter. Also, the bottom in all these coves is sandy and shallow so anchors hold well. I put up the tent and went to sleep. By the time I woke up other boats had arrived and it was not as peaceful. I swam and went ashore for a long walk. For dinner I had some left-over roast and I went to bed rather early. I was not sure whether to go to Syros tomorrow or, taking advantage of the relatively calm south-westerlies, to push on further NW. 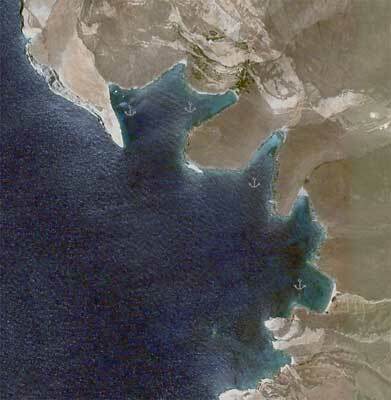 I want to ultimately reach Tzia (Kea) and visit with my younger brother Byron who has a house there. After waking up I decided to push on towards Tzia and visit Syros on my way back to Samos where I have to be by the 30th of August when Alice will arrive from Washington D.C. I prepared for departure and left at 0800. The sea was very calm with a light 5 knot WSW breeze. We motored to the N end of the island and then turned west towards the N end of Syros which we reached a little past noon. 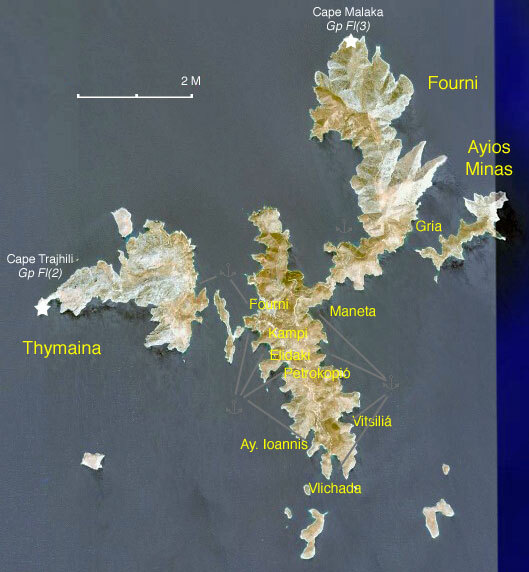 I was still undecided whether to push on for Koundouros bay in Kea (Tzia) where Byron’s house is or to stop at either Loutra in Kythnos or Poles on the E side of Kea. I called Byron and he assured me that Koundouros, despite being exposed to the SW, was calm. The wind in the mean time had increased somewhat reaching 12 knots SW. By that time though, I was tired of being exposed to the strong sun and I had already put up the tent. So, I just opened 40% of the headsail and we motor-sailed at reduced RPM. I had to tack 30° to the N to keep the sail happy but at any rate we were approaching Tzia at the good speed of 5.7 knots. 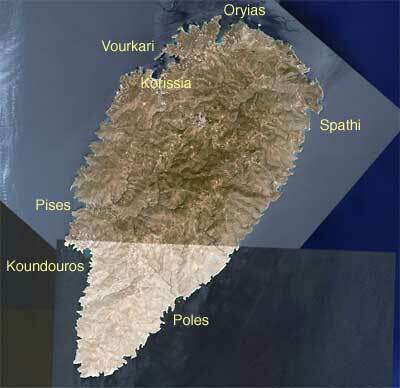 We arrived in Koundouros [37° 34.8' N 24° 16.1' E], Tzia (Kea) at 1800 after 59.3 M (nautical miles). Byron was already waiting for us with his large inflatable, Ivi II, and helped me to anchor and took a long shore line to a rock. There was some swell but it was not uncomfortable. Later we went to his house which is located at the top of the hill of Katevati where we had a “sundowner” while watching a spectacular sunset over Cape Sounio. For dinner Byron, his wife Ivi, and I went to the nearby Saint George restaurant where we were soon joined by Pascal, Thanasis, and Floretta, all long time friends. We all had such a good time that by the time I drove Byron’s borrowed motor-scooter to where I had left the dinghy it was past 1 AM. The people from Katevati, the hill where Byron and his friends have a group of houses, do not get up early. Despite the late bed hour, I did. I spent the morning siphoning 3 jerry cans of fuel into the main tank, swimming, and reading. There was hardly any wind and the day promised to be brutally hot which it was. After 9:30 Byron kept sending me messages to go up to his house. I eventually got there by 10 and after they had finished their breakfast I showed them pictures from my grandson’s 3rd birthday and from my transatlantic trip which are stored in my computer. Ivi declared that she will go swimming with the “girls” but prepared a picnic lunch for Byron and me. Byron drove down the steep hill his truck and I his scooter. After getting the melon I had from Samos and the empty jerry cans into his inflatable we went to a beach for lunch. It was already 2 PM and I was starving. Then, later in afternoon, we rode to the harbor, Korissia, where we were met by a mini-tank and filled my cans and the capacious gasoline tank of Ivi’s II. Then we had an espresso and Byron did some shopping and fulfilled the shopping list that Ivi had given him. By the time we got back to Thetis it was 7. I was told in no uncertain terms to be up in Katevati for “sundowners” before the sunset. Thetis’ cabin was very hot, 32°C (90°F), despite the tent. 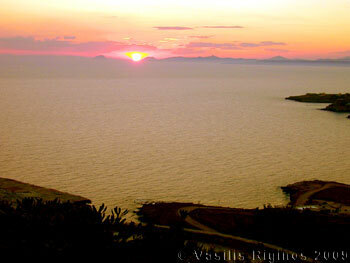 After the sunset we all went to Thanasis’ and Pascal’s where the whole Katevati troupe was invited for dinner. There were in addition to last night’s group, Spelios and Haroula, Nikos and Elenitsa, and another couple from another valley. Thanasis had prepared a terrific tourlou (baked eggplants, potatoes, onions, and other vegetables) which had in addition to the usual vegetables some cheese that he had brought from Kimolos. There were also a mountain of grilled lamb chops, again Thanasis was the griller, baked potatoes, salads, and several other dishes to be followed by a fruit tart made by Pascal and a chocolate mousse by Ivi. Lots of wine and the usual conversation but with an emphasis on health related topics. I guess the group is aging. Driving down the hill with the scooter at 2 AM was kind of scary. The forecasts predicted another calm and hot day. I have no idea what the program of the day was going to be other than that Ivi’s mother and our childhood friend Evi and her husband are expected to arrive from Athens this evening. The intense socialization continued. Byron called me about noon announcing the troop’s intension of going with their boats to the lower E side of the island for swimming and picnicking. He arrived shortly followed by Thanasis, then Spelios. Their other neighbor, Nikos Rotas, appeared around 1:30. None of the ladies. I ferried them with the dinghy to their respective boats. They all, except Byron, have now small fishing-type American cruisers. Byron came to Thetis and we had some juice. The rest did things in their boats. Several frantic phone calls were exchanged with the Katevati headquarters. Then by 2:30 the ladies started appearing. Pachal, then Eletistsa with her two boys, then Floretta and Haroula, and finally Ivi. All four fast boats then raced to a nice sandy cove where there were just a few other people with 2 SUV’s. The sea was great. Lots of ouzo was consumed, some left overs from last night’s party, and some new dishes. The tomatoes I had brought from Kalami and the melon from Samos were much appreciated. Around 4:30 Ivi became very restless because she was expecting her mother, kyria Areti, due to arrive with the 7 PM ferry together with Evi Galazidou and George Gardeniotis, Evi’s husband. At that point the phone rang. It was George. It seems that kyria Areti had turned on the alarm of Ivi’s apartment which went off and all the neighbors were complaining. Neither she nor George nor Evi could figure out how to silence it. The telephonic connection was bad and they could not follow Byron’s instructions. Eventually Byron untied his inflatable and drove some distance offshore, called George, and tranquility was restored on all fronts. As the Rota’s vessel was leaving early, Ivi went with them to prepare for the reception. By 7 we were all back in Koundouros and I was allowed ¾ hr to wash and change but I was sternly warned not to be late like yesterday for the “sundowners.” I made it just in time driving the scooter up the steep hill. It was nice to see Evi after all these years but also a shock. In the winter, during a snow storm, while exiting from her apartment she had a bad fall which resulted in multiple fractures. She has had several operations and she now moves on crutches. Nevertheless, a number of childhood stories were exchanged. It was fun. Then we all moved venue to Haroula’s. She had prepared a baked young goat and there were many other dishes contributed by the other households. Spelios, in an affable mood, presided over the drinks. In addition to the usual suspects there was the Sakelariou couple from another valley. His older brother was a classmate of mine in Athens College. The party started to dissolve at 3:00 AM. Fortunately the Sakelariou gave me a lift and I was spared the scooter drive down the cliff. Then, the dinghy’s anchor was stuck and I had to abandon it. Fortunately this morning I managed to retrieve the dinghy’s anchor and without an early morning dive. I left Koundouros, Kea at 0830. Although I was somewhat apprehensive to remove by myself the shore line and then rush back on Thetis and raise the anchor fast enough before she drifted near other boats it all went smoothly and without any mishap. There was a very light breeze of 5-10 knots from anywhere between SW and NW. The sun was very hot. Since there was no chance of serious sailing I put up the tent and opened 40% of the headsail. 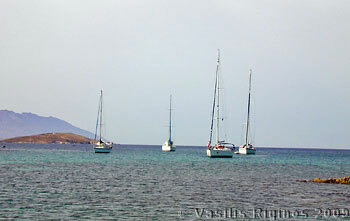 We motor-sailed on and off in the calm sea for the 31.8 M to Grammata [37° 29.9' N 24° 53.4' E], Syros where we arrived at 1420. I anchored in 6 m depth. There were 2 other sailboats in the cove, both charter-boats. Soon these left and were replaced by 2 others with lots of people, I counted 14 in one of them. They spoke a Slavic language and were very lively. They had a guitar and sang, rather nicely, Greek and their native songs. These were joined by 2 Greek motor boats, also full of people and especially some noisy kids. Day-trip boats kept bringing more people to the little beach. The place was very lively. It was also very hot: 34°C (93°F) inside the cabin, but frequent jumps into the water kept me comfortable. Tomorrow is a big holiday in Greece so this makes it a 4 day weekend. By 7 PM all were gone and Thetis was left in peace. It was still hot but with the sun low I took down the tent. There was absolutely no wind. Earlier I received a phone call from my friend Elias Vassiliades. 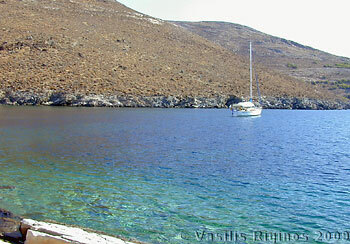 He and Frosso are with their boat S/Y Semele II in Kythnos. 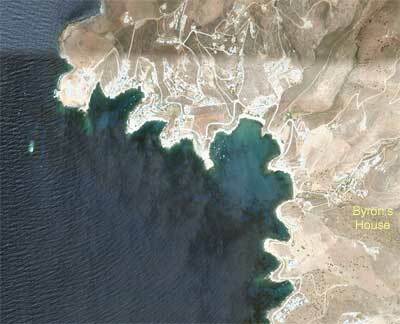 We agreed to meet tomorrow evening in Finikas, the large bay in SW Syros. For dinner I ate the last of the roast with spaghetti. Being a little tired I went to bed early. I slept very well. Today is a big Greek holiday, devoted to Mary, and everything will be shut. Because of that I plan to stay here until late in the afternoon and then move on to Finikas. The morning was hot and lazy with a lot of swimming to keep cool. In one of this swims I put on a mask and inspected the anchor. Its chain was wrapped around a rock and I may have some difficulty raising it. At 1705 when I started raising the anchor and I was very pleasantly surprised that it did not foul. By that time the wind was 5-10 knots WNW. I kept the tent but opened about 45% of the headsail and sailed. The battery monitor, a most useful device that shows the charge level in ampere-hours, stopped working. I tried to trace the cause but did not succeed. 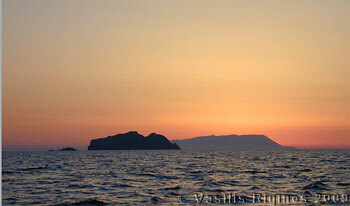 We arrived in Finikas or Phoenikas [37° 23.4' N 24° 52.8' E] after a slow sail of 8.2 M at 1835. 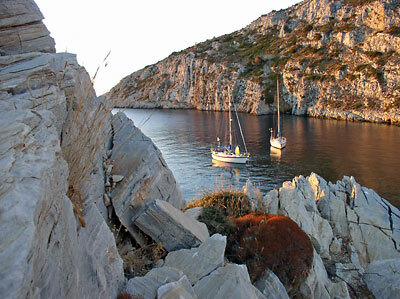 In Finikas there are two options: go stern-to to the quay of the little municipal marina or anchor off. I always prefer the later because there are no lights and it is much quieter. I anchored in 6 m depth over sand letting out 40 m of chain. Semele II was already there also anchored off. I went over with the dinghy and we had an ouzo. It was nice to see again my old friends. 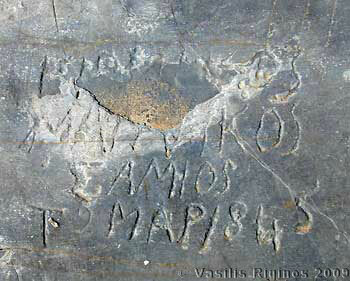 I spoke also on the phone with my Syros friend Yankos Krinos. We agreed to all get together in Finikas later for dinner. We did so at the reliable Dionysos restaurant. Yankos had not met before neither Elias nor Frosso. During the dinner conversation it turned out that Yankos and Frosso are distant relatives. This does happen with Greeks frequently enough. The wind was up today blowing 10-25 knots NNW. Semele II left in the early morning. While it was cool I devoted myself into troubleshooting the problem with the battery monitor. Soon enough I located the trouble to a corroded wire connection. I cut away the corroded wires and re-solder them using the 220V soldering iron and the 12V DC to 220V AC inverter. Problem fixed. I then went ashore with the intention of renting a motor scooter. Unfortunately the rental place that was operating at Finikas up to 3 years ago does no longer exist. I inquired at the Maistrali chandlery. The friendly lady, who did remember me from other times, informed me that the nearest rental is in Galissas. She called them and somebody promised to come and get me. While waiting for the scooter man, I saw the cutest folding small stainless steel anchor for the dingy. Alas it was already sold but the chandlery lady assured me that they do have it in stock in their main store in Ermoupolis. The scooter man came and soon enough we were at his store where I signed a contract and pre-paid him for 2 days. Having done so, I will be able to leave the scooter at the Maistrali store in Finikas. Now having wheels I drove to Ermoupolis. The first stop was at the main store of the Maistrali chandlery where I bought the tiny anchor, some stainless cleats, and a set of air-pump adaptors with the high hope that they may fit into the air-intakes of the dinghy. Next stop was the market place where I had a haircut, and bought some provisions including a piece of the famous St. Michalis cheese and capers both specialties of Syros. I then drove to Piscopio and to Yankos’ mansion. 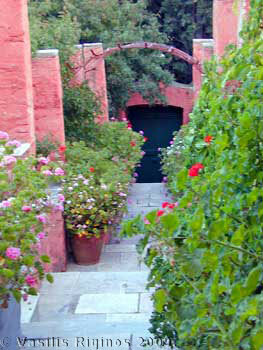 First we went with his car to Galissas for a swim and then back to Piscopio for a late lunch in his delightful porch. I then returned to Thetis for a rest. By that time the wind had picked up and the sea was angry. The forecast called for NW winds of force 6-7. Being hot, despite the wind, I had another swim and I also checked the anchor. No problem there: it was nicely embedded in the sand. In the evening I rode the scooter back to Piscopio and joined Yankos and his caretakers Nikos and Kiki for Samian Suma (a drink similar to ouzo but not anise flavored) while watching the sun go down. I did not stay for dinner but went back to the boat because I was rather tired. I ate a light meal of fresh bread and cold cuts. Unfortunately even at my distance from the shore I could still hear the loud “music.” I did discover however, that what I dislike even more that american rap “music” is its greek variant. For the past few days the autopilot has been making groaning noises. So, this morning I opened it, oiled its inner mechanism, and greased its gears. After reassembly it worked fine and stopped groaning. Yakoumis, as I call it, was now happy. Later in the morning I drove the scooter back to Ermoupolis. My first stop was the Orologas chandlery. This chandlery was started by the late George Orologas a great story teller and maker of beautiful model ships. Now it is owned by his niece and her husband Lefteris Mpoyiatzoglu. There I bought 3 m of stainless steel chain to go along with the new anchor. I then visited the Industrial Museum that opened a few years ago. It is very interesting with many old machines, pictures of the late 19th century, and models of ships and industrial buildings. One, which is now being restored, was a BB (pellets for hunting) foundry. It has a tall tower from which the molten lead was dropped to form perfect spheres. After the museum I went to the loukoumi (turkish delight) factory in Piscopio and bought some gifts. I did not see Yankos until the late evening. We went to the Mitsos restaurant in the village of Alithini with a fantastic view of Ermoupolis and Ano Syros. 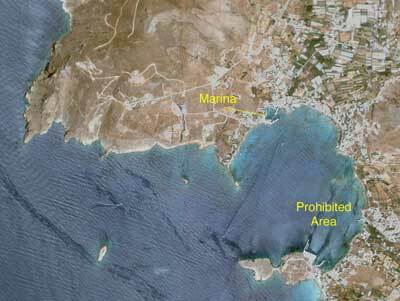 When I returned to Thetis and after consulting the weather forecasts I set the alarm for 5 AM to take advantage of the relative calm for my passage to the island of Paros before the weather deteriorates any further.